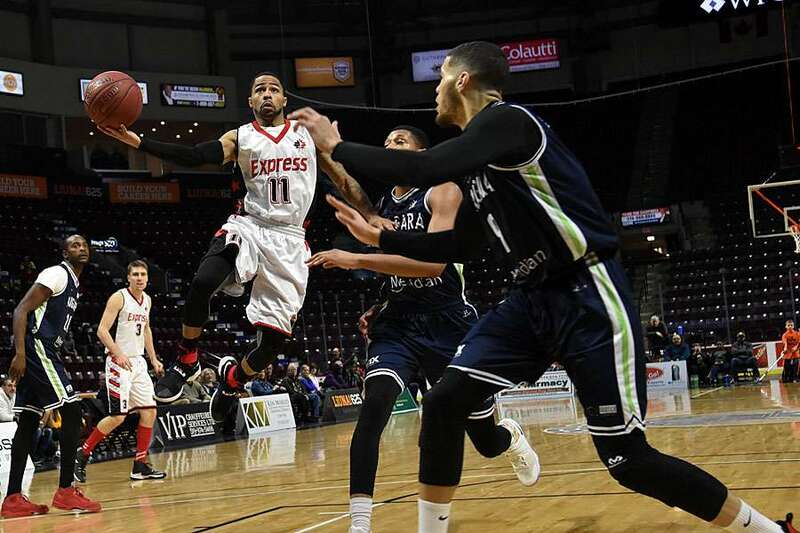 (WINDSOR, ON) – With a 3-game winning streak on the line, the surging Windsor Express hosted the division-leading Niagara River Lions Friday night in front of almost 2,000 fans. The Lions broke the streak and dropped the Express to two games below .500, but needed overtime to scratch out a 102-99 win. Niagara opened the scoring with a strong move to the rim, but Logan Stutz turned the table with an unhurried drop from 3-point range. It took both teams to settle down, though, as they shook out their initial nerves. The Express had played the night before in London; a hard fought 123-120 win. Head coach Bill Jones wasn’t using the back-to-back games as an excuse, however. The score remained 3-2 for the first 3:15 of the game. A second Niagara bucket broke the stalemate and Stutz responded with another from downtown. Chad Frazier then hit from beyond the arc to establish Windsor’s outside game. In fact, Windsor’s first 12 points all came on the long ball as Maurice Jones also got in on the action. By the end of the opening quarter, 5 points separated the teams, 30-25 in Niagara’s favour. The River Lions went on the prowl to start the 2nd period. The play remained very ragged and disjointed as both teams continued to have handling issues. Windsor’s staunch defense kept Niagara’s scoring in check, but the balls kept bouncing off the iron at the other end of the court. With a minute left to play in the half, the tally was 48-44 for the River Lions, a low scoring period of missed chances and dropped passes. Express forward Shaquille Keith echoed Jones’ sentiment. Entering the 2nd half down by 2, the Express had trouble finding their footing as they dropped further behind. At one point in the quarter, Windsor trailed by as many as 11 points. Braylon Rayson led the comeback, though, with a series of treys to bring the Express back into contention and into the lead. The teams teeter-tottered through the beginning of the 4th quarter as they traded fouls and and a few buckets. The fans were brought to their collective feet when Sefton Barrett knocked a Niagara shot off the Windsor backboard to prevent a scoring play. The Express continued, however, to give up far too many second chances to Niagara in the paint. At the other end, Niagara’s Adam Klie went 0-for-4 from the line and Windsor converted their chance into 5 points. But, they also continued to send the River Lions to the penalty stripe and couldn’t escape the free points forever. Niagara crept into a 3-point lead. Windsor’s Demontre Harris and Carl Hall from the Lions each fouled out of the game with under 3 minutes to play. With 2 minutes on the clock, Niagara was clinging to those three points. At 1 minute Windsor had scratched to within 1 when Guillaume Payen Boucard dropped a triple for Niagara. Jones returned up court and drew a shooting-two foul from Jaylon Tate. Jones converted from the line and then fed Shaquille Keith for the game-tying bucket with 3 seconds to play. Keith picked the pocket of a Niagara player and took the ball into the River Lions zone. He then found himself on the stripe and immediately put two through the hoop. The Lions then dropped two, courtesy of the officials, and took a 1-point lead, 98-97. A single point continued to separate the teams when, with 22 seconds on the clock, Windsor had the ball at the side court. A shot from outside bounced off the rim. Tate made made two freebies on an ensuing play to put the game away. Jones recognized the better play of late by the Express and that the team ran with the division leaders. Keith wanted to focus on the positive take-aways from the game and look at the progress the Express have made of late. Keith and the Express will need to take that positive attitude into their next match this coming Tuesday when they take the rock to the Rock for back-to-back games with the St John’s Edge. They are scheduled to play 5 games over the next 7 days. Within that stretch, the Express will return to Windsor for a home tilt with the Island Storm on February 9. Tip-off is at 7pm.